In our last post, we took a look at three different tips to help you out in your home tree maintenance journey as summer comes to an end. 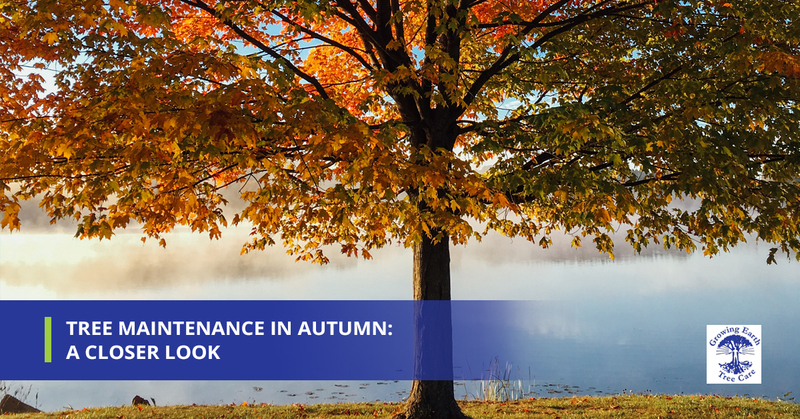 As the days grow shorter and Autumn takes hold, we wanted to continue our look into tree maintenance in the fall for homeowners and business owners alike. Previously, we mentioned the need to fertilize, addressed seasonal pruning, along with watering and some degree of mulching. Each of these techniques has a place in fall tree care. Fertilization during the fall can help keep your tree in a healthy way during harsh winter months, when nutrition from the soil is harder to come by. Seasonal pruning certainly has its place, but we recommend talking to a certified arborist before employing a fall-specific pruning plan, if it’s anything outside of the ordinary. Applying a layer of mulch to your tree can be a fantastic idea to provide an additional layer of nutrition and insulation for the base of your tree. When applying mulch, however, make sure you don’t choke the trunk of the tree by leaving a few inches of breathing room at the base of the tree in question. Supplying your trees with a little extra water before the first freeze is only going to help as well, so that is another tip worthy of consideration. In today’s post, we will continue with this trend of tip offering. We will even take a special look at evergreen tree treatment in addition to some tips to get your entire yard looking great this Autumn as well. Keep reading if you are interested in making sure your whole yard is in tip-top shape! This may feel like an insult to some of you who are thinking, “Of course we should remove that fallen limb from the backyard that fell down a few days ago and is an eyesore.” To others, it might be a great reminder, leaving you thinking “Wow! Thanks for the reminder, Growing Earth Tree Care. I can’t believe I forgot about that fallen limb that has been a decaying, hazardous eyesore for the past two months. We should really take care of that, honey.” Either way, we are here to help. And either way, removing decaying or dead trees is a good idea, even if they haven’t fallen down yet. The decay is a great habitat for pests and diseases to thrive. That’s how problems with other trees and your home can start. Just because it’s getting colder out doesn’t mean that every bug dies after the first frost. When it gets colder, some pests burrow further within a tree for warmth and protection, which can destabilize the tree in some cases. Talk to your local tree pest control experts for emergency pest control and pest solutions. Maybe your household has a person, one of the strange kinds, who likes to wrap all of the presents during the holidays. Channel your inner Tom Sawyer and put that person’s odd interest to good use by letting them wrap trees instead of presents. Why? It’s funny, number one. Number two, some trees, when they lose their leaves also lose their protective canopy from the sun. Sunscald can damage the tree’s bark, but is easily remedied with inexpensive paper tree wrap. So this tip can be both entertaining and practical! Every year, the odd seedling can take root and begin to rear it’s tiny trunk, making itself known to the world. Your job, as a responsible homeowner, is to crush this seedling’s hopes of existence for the good of the pack. The pack is the trees that already exist, of course, in addition to your own human family, in the house. They factor into the equation by being privy to the benefits of being under your home’s roof. Seedlings can sometimes grow out of place and split your foundation apart. Hence, you need to remove the seedlings. Call your local tree care specialists, if you don’t have the stomach for it. Within Arlington County, Northern Virginia, and into Maryland, evergreen trees are quite common. Ideal for providing an ample amount of shade in the spring and summer along with its wind-breaking attributes in the winter time, evergreen trees are useful the year round. If you are considering planting an evergreen tree, do so with the future in mind. They can grow very tall, so they shouldn’t be planted beneath a power line. If you’ve already planted an evergreen tree and are interested in evergreen care, you may have noticed a few things happening. Evergreen trees can accelerate the rate at which they drop their needles around this time of the year. This can usually be attributed to either an excess or a deficiency in water. Another phenomenon you might notice is that your evergreen tree’s interior needles might begin to brown. No need to be alarmed, as this is merely part of the tree’s seasonal cycle of behavior. If, however, your tree’s needles yellow at end of its branches, you should contact your local tree care specialists. It could be a variety of issues, so we would need to inspect these occurrences on a case by case basis. Although we do not specialize in landscaping or yard care, we can still contribute to the end-game of having a fantastic looking yard. When you mow your lawn during the fall, do so at your lawn mower’s lowest setting in order for the sun’s rays to get into contact with the crown of the grass. That way, there is less surface area to turn brown as winter approaches. Keep in mind, however, that you should never trim down more than a third of the grass’ total length. Consider going down to your lowest setting in increments, so as to not totally shock your grass. Other tips that will help you out in your quest for the perfect yard are to rake your leaves, aerate your soil, and fertilize your yard. If you only fertilize your yard once per year, fall is the time to do it. Fertilizing in the fall will help your grass’ root system to accelerate growth, as roots don’t slow their growing the way the blades do during this time of year. Aerating your soil is a good idea as well. It typically won’t cost you more than $75 to rent a gas-powered aerator for the day. This way, the fertilizer you applied will take hold more easily, as will the oxygen and water that are nourishing your lawn. Finally, don’t wait until all of the leaves have fallen off of their branches to start raking. If they remain and get wet, they can form a clumpy mess. Under this mess can form fungal diseases. If you have a fungus issue on any of your trees, give us a call for tree disease diagnosis and tree fungus treatment. We are a full-service tree care company, providing commercial and residential clients with quality tree maintenance services like tree stump removal, tree pest control, stump grinding, and tree pruning. With an Accreditation by the Tree Care Industry Association and an A+ rating on the BBB, it’s easy to see why so many residents in communities like Great Falls, Alexandria, Arlington, Ashburn, Vienna, and Springfield are choosing Growing Earth Tree Care as their certified arborists of choice. Get your free estimate today!